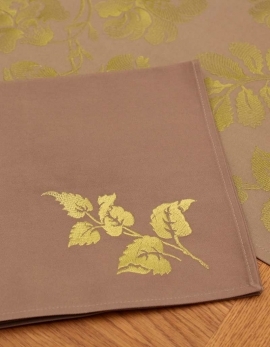 This classical and timeless set of table linen is composed of table runner and napkins in pure cotton. Inspired by a drawing of the eighteenth due to the textile designer Ana Maria Garthwaite, this sumptuous garland of flowers and foliage will adorn your table with a subtle poetry. 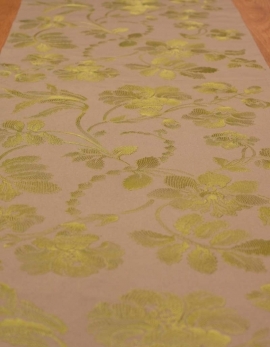 The green tone embroidery generates volume effects on the dark-beige cotton. French fabrication. The napkins and the table runner are made of thick cotton canvas but the napkins are slightly darker. Table runner made with soft and thick pure cotton, dark beige colour, embroidered with light green color thread. Soft and thick dark beige cotton, embroided with light green color thread. Neat mitter corners. Made in France. Napkin is slightly darker than the table runner.